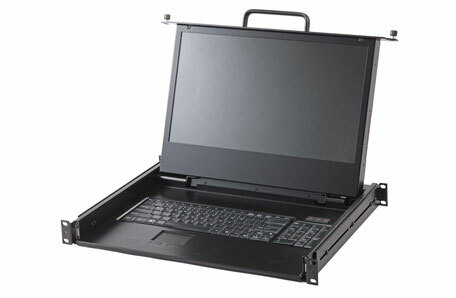 DKM-17HD is designed to fit in rack or cabinet that is short in depth. Minimum required length for installation is 14.5″ and adjustable up to 24″. Unit weighs only 20lbs. 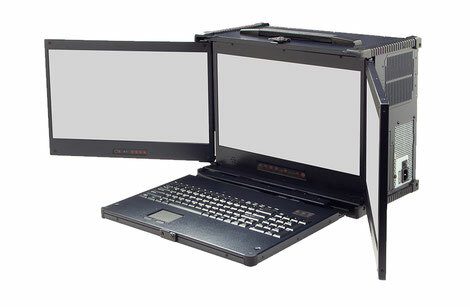 The LCD monitor is built inside a slim and rugged aluminum housing for durability. The display mechanism is hinged so that it can be tilted to the most comfortable viewing position. LCD folds down on top of keyboard when recessed into the drawer. An auto shut-off switch will turn-off the power to the LCD monitor when the LCD is in recess position. The LCD monitor is powered by a 60W 100-240V full-range power supply positioned at the back of the drawer with a rocker on-off switch. The keyboard, pointing device and video connectors are also positioned at the back of the drawer for easy access. A key locking mechanism locks the drawer when in the full recess position, to prevent unauthorized access. 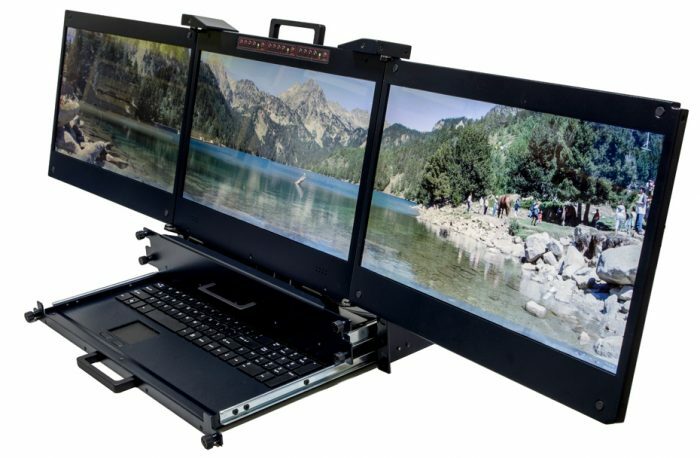 DKM-17HD is a light weight, short depth solution that combines a keyboard, touch pad, 17.3″ LCD monitor and a pair of amplified stereo speakers in 1U rack mount drawer. With the slide rails included, the unit can be fit into any standard rack chassis ranging from 14.5″ – 24″ deep. Clearance to raise the monitor is only 13″ pull. The Spark-S9 is designed with the product’s compactness and mobility in mind. Chassis is constructed by all aluminum outer shell with shock absorbing composite rubber corner blocks. The internal 3.5″ drive bays are shock-mounted to protect the hard disk drives from damage. It provides protection to the computer unparalleled by any other chassis. The chassis can be easily customized for application that has requirement for mobility with PC add-on slots or disk drive expansion. The S9-17HD offers 7 expansion slots and total of 6 drive bays. The S9-17HD uses standard off-the-shelf components to optimize cost without compromising performance. It supports standard or micro ATX motherboard and most 3.5″/5.25″ devices. SPARK series is our economical design focused on compact, lightweight and portable. The S9-17HD provides a solid base to build powerful PC with moderate expansion capability, featuring a 17.3″ HD monitor with 1920×1080 resolution. 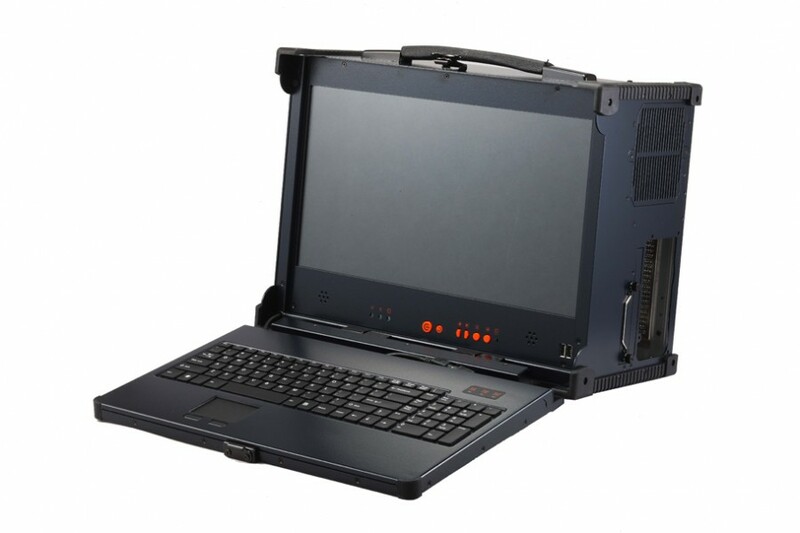 It is capable to fit standard or micro ATX motherboard, one 5.25″ device, two 3.5″ HDD, one 2.5″ removable HDD and one notebook slim optical drive. Viele Geräte auch als Backplaneversion (10-slot oder 14-slot Version) erhältlich.